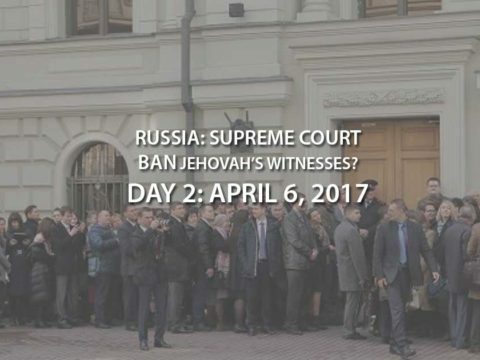 April 7, 2017 – Third day of the Russian Supreme Court hearing of the case brought by the Justice Ministry to ban Jehovah’s Witnesses in Russia. Based on a translation from a source inside the Russian Jehovah’s Witnesses’ community, here is a summary of the events which took place today in the Supreme Court in Moscow. This is a translation of what is found on jw-russia.org. 10:00 The court proceedings began with questioning the representative of the Ministry of Justice. The court tried to understand the Ministry of Justice’s charges against the Administrative Center in regard to a situation in 2014 when the Administrative Center imported a publication into Russia which later was recognized as extremist material. In other words, the court was interested in the question of how the religious organization could know that such a book would be recognized as extremist if it was not on the Federal List of Extremist Materials. The court tried to understand which rule of law the Justice Ministry relies on when arguing that the Local Regional Organizations (LRO) are “structural units” of the Administrative Center. The Justice of Ministry argued that the logic is in the fact that the various organizations have the same literature and all are related to each other. Is this a violation of the right to freedom of religion enshrined in the European Constitution? After all, the 395 LROS have been denied leave to participate in the case as co-defendants. Questions remain without distinct answers. How is the financing of the LROs by the Administrative Center the basis for financing extremist activity? What is objectively proved? If nothing, then what are the Ministry of Justice claims based on? 10:28 The defendants were given an opportunity to object. Omelchenko, a lawyer for the Administrative Center, applied for the inclusion of Russian newspaper extracts that have dates of the entry of certain publications into the Federal List of Extremist Materials. The court accepts the entry. 10:35 Vasily Kalin, chairman of the steering committee of the Administrative Center Center of Jehovah’s Witnesses in Russia was the first to speak. “Are today’s efforts to ban Jehovah’s Witnesses lawful? “For 26 years, the Administrative Center has not been brought before the courts for extremism. “If we have been good all these years, at what point did we become extremists? “If the ban happens, significant harm will be done. Persecution has already begun. “People will be persecuted simply for coming together to read the bible. We have already seen this happen. “We are being put on a par with such organizations as The Taliban, Aum Shinrikyo, and others. “The position of Jehovah’s Witnesses remains unchanged: Obey the authorities and pray for them. Always adhere to the principles of peacefulness. 10:45 Kalin went on to explain the situation of when the religion was repressed in the USSR, something he remembers himself. He showed the court a certificate of a rehabilitated victim of political repression. He asked if there was another certificate that the Ministry of Justice wanted from him or his colleagues. He believed that the actions of the Ministry of Justice would throw the country back into the past! 10:50 Sergei Cherepanov, a colleague of Kalin was next to speak. He told the court what measures were taken by the Administrative Center of Jehovah’s Witnesses for the prevention of extremism. He explained that the Administrative Center is on the list of the most dangerous organizations. He believes that the actions of the Ministry of Justice lead the fight against extremism on the wrong path. In recent years, 20 criminal cases have been initiated against Jehovah’s Witnesses under the extremism bill. Most of those cases ended in acquitals. Yet, the rights of the believers were significantly violated and their lives marred. Note from AvoidJW.org: Lives of anyone should not be marred because of what they believe or do not believe. Jehovah’s Witnesses should think about this when they shun members who no longer believe what they believe. The shunned ones’ lives have been marred. Cherepanov mentioned cases where false allegations were reported to law enforcement agencies but that were completely ignored by the police and other bodies. There was no doubt in Cherepanov’s mind that the Administrative Center of Jehovah’s Witnesses have taken all possible measures to counter extremism. Cherepanov said that the Deputy Prosecutor General, who signed off on a warning to Jehovah’s Witnesses a year ago, refused to meet with them to clarify what measures the Prosecutor General’s office expected them to take. The whole civilized world struggles with extremism. However, only in Russia are Jehovah’s Witnesses persecuted for their worship, despite attendances at their meetings of about 20 million people from around the world. To pursue them in Russia is to challenge all those countries where Jehovah’s Witnesses freely profess their faith. Contrary to the Ministry of Justice assertion, he explained that there is no extremism within the goals and objectives of the Jehovah’s Witnesses. In Jehovah’s Witnesses existence in Russia (100 years unofficially and 26 years officially). there was no proven harm from there activities. What harm does the Ministry of Justice refer to? Zhenkov drew attention to the fact that 8 years ago the vast majority of Jehovah’s Witnesses’ publications were included on the Federal List of Extremist Materials. During those years, there was not a single terrorist act or act of vandalism on the part of Jehovah’s Witnesses. Nor before then either. Zhenkov drew attention to the fact that all these publications were included in the Federal List of Extremist Materials before the famous resolution of the Assembly of the Supreme Court which explained that extremism could not be considered criticism of other religions. Zhenkov emphasized that only some experts find signs of extremism in the literature of Jehovah’s Witnesses. He believed that such experts were unskilled in this field. He went on to say that the courts considered the evidence in the absence of believers. For example, one of the brochures, which contains almost no text, was considered extremist because of the phrase, “Avoid bad deeds”. Jehovah’s Witnesses are still wondering why two other publications made the Federal List of Extremist Materials despite many requests for answers from the authorities. Zhenokov informed that court that the Jehovah’s Witnesses have appealed to the European Court of Human Rights (ECHR) in cases where their literature has been recognized as extremist. 22 complaints had been combined into one. In response to a request from the Strasbourg Court, the Russian Federation formally acknowledged that the literature of Jehovah’s Witnesses does not contain open calls for violence. The Supreme Court repeatedly ruled that the rights of the Administrative Center of Jehovah’s Witnesses in Russia were not affected in any of the cases where the Jehovah’s Witnesses’ materials were recognized as extremists. Such rulings have not been rescinded. Yet, now the Ministry of Justice does believe otherwise – that such rulings do affect that rights of the Administrative Center. Zhenkov informed the court that printed materials of the literature recognized as extremist were never imported into the country. This also applied to all cases where the Justice Ministry referred to believers in their case. When publications were imported into Russia by the Administrative Center of Jehovah’s Witnesses, the results of examinations did not reveal any signs of extremism in almost all cases. Therefore, the center could not have foreseen that these or other materials could be considered extremist. Note from AvoidJW.org: Zhenkov specifically refers to “printed materials”; he makes no mention of electronic materials entering the country that are recognized as extremist. Legislation, said Zhenkov, is based on the principles of legal certainty and predictability of the consequences of certain actions. However, in the actions of state bodies against Jehovah’s Witnesses he believed this principle was not observed. 12:10 Toporov, representative of the Administrative Center of Jehovah’s Witnesses, spoke next. Neither the Prosecutor General’s office or the Ministry of Justice have provided any evidence of casualties, victims or victims of alleged extremist materials. Toporov refuted the claim from the Ministry of Justice that they finance extremism. The financial aid to the LROs was simply to service the religious buildings, pay for public utilities and sometimes to help believers who have suffered from natural disasters. Toporov said that the Ministry of Justice was encouraging the Supreme Court of Russia to resort to double standards. Previously, the court, with the support of the Ministry of Justice, held a consistent position that decisions against LRO did not affect the rights of the Administrative Center. Yet, the position of the Ministry of Justice has changed to the exact opposite. It is trying to extend sanctions imposed on several LROs to all the other 395 LROs of Jehovah’s Witnesses. Toporov analyzes the legal meaning of the term “within the structure of a centralized organization”. Referring to legislation, statutes and legal opinions, Toporov explained that they were only talking about the canonical and spiritual aspect. He claimed that LROs are not branches or representations of a centralized organization. He claimed that the centralized and local organizations of Jehovah’s Witnesses are not responsible for each other’s obligations. He said that the Administrative Center is not the founder of any of the LROs. Each of them have their own founding members who are made up of 10 citizens or more. Each LRO have their own unique name, its own charter, detached property, the right to enter into civil-law contracts. Note from AvoidJW.org: These statements from Toporov are not entirely true. LROs may not be branches of the centralized organization but the LROs are directly controlled by the Administrative Center. Likewise, the Administrative Center is directly controlled by the World Headquarters of Jehovah’s Witnesses in New York. The organization of Jehovah’s Witnesses is highly centralized and all structures within the organization are governed at a local, national and ultimately an international level. Therefore, it is very deceptive reasoning by Toporov to say that the LROs are not branches or representation of a centralized organization. Furthermore to say that they are not responsible for each other’s obligations is true of the LROs towards one another but it’s not true of the Administrative Center – it is responsible for ensuring that the LROs meet their obligations. The entire judicial system of Russia is a single structure but the regional courts are not structural subdivisions of the Supreme Court, but independent institutions. Why then, should the overwhelming majority of LROs, 380 in Russia, who never received any claims from the state, should be liquidated, even without any warning or opportunity to change something? In this case, said Toporov, there were hundreds and hundreds of inspection results of various departments that did not reveal any violations in the activities of all these LROs. Why are the 22 Crimean LROs, registered under Russian Law, why have not committed any violations. being considered extremist and having their property confiscated? Why is the Moscow LRO, registered under the order of the ECHR and not having committed a single offense, being subjected to such severe sanctions? 12:52 Maxim Novakov, a representative of the Administrative Center of Jehovah’s Witnesses spoke next. He devoted his speech to the “new facts of extremist activity” to which the Ministry of Justice refers in its suit. Novakov referred to fines imposed on several LROs because of the discovery of extremist materials in their religious buildings. He said that the Administrative Center was not invited to participate in their cases so they did not have an effective opportunity to raise the issue of provocation. Furthermore, there was no evidence presented to the court to establish strength to the cases. Judicial orders imposing fines cannot have prejudicial force. Otherwise, this would be a violation of a right to fair trial. Decisions that were being referred to by the court were closed “boxes” but the content of those boxes is not well understood. To have a holistic view or to give an objective assessment, the court must assess the circumstances of what took place. The reality was that riot police rushed into the services, threw all the men on the floor, they were not even allowed to raise their heads, while unknown men moved uncontrollably through the building. There are camera recordings where riot police stormed the building andtossed banned materials into the literature cupboards and then they “discovered” them. Novakov referred to the detail of one case where materials were recently found. It turned out that on one of the publications “discovered”, it had an inscription proving that it belonged to one of the anti-sectarian centers of the Orthodox Church. Novakov drew attention to the fact that the term structural unit is defined in the title of the relevant chapter of the law: the concept of “structural unit” is relevant only to political parties. 13:25 The court will resume on Wednesday 12 April 2017 at 10 a.m.